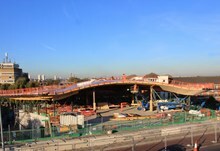 Abbey Wood’s new station is beginning to take shape with the timber structure of the distinctive roof now complete.The Austrian timber construction firm, Weihag, has installed the impressive glulam wooden panels which form the iconic shape of the station’s roof structure. The roof has been constructed using a combination of 31 tonnes of steel beams and girders to support the loads of the beams. The main timber beams are each 45m long, which is the equivalent of four London buses end to end. Network Rail began work at Abbey Wood in 2013 to build the new landmark station, renew existing track and build the new Elizabeth line infrastructure. The work to the existing track is now complete and considerable progress has been made to the station building. The area of the new concourse, which is now built, measures 1500m2 and is the size of six tennis courts. The new station will open in late 2017 for Southeastern services and Elizabeth line services will begin in December 2018 when journey times to a number of central London destinations will be halved.